St Swithun’s Lodge was founded on 15th May 1974 and meets five times a year on the third Thursday in May (Installation), June, July, September and October. The lodge meetings start at 6:30pm. 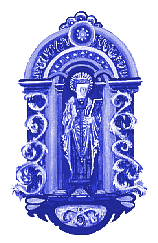 The Lodge Logo is (almost) that of the St Swithun’s shrine at Winchester Cathedral. Who was St Swithun? He was the Cathedral’s much-loved Saxon patron saint. It is known that he was born in Winchester around 800, became counsellor to the Saxon kings Egbert and Ethelwulf, and was Bishop of Winchester for the last 10 years of his life. When he died in 863, he was buried in front of the west door of the Saxon Old Minster. Popular legend insists that the monks tried to move St Swithun inside the Old Minster, some nine years after his death. The saint, however, did not approve of his removal from exposure to the elements. There was a clap of thunder and it began to rain for forty days and forty nights! When the Lodge asked the cathedral in 1974 for permission to use this logo, it was refused. So a local artist (from Kennington) was engaged to make sufficient alterations to it to make it “different” from the original. And that is how our logo came to be as it is today. For many years the lodge meetings used to be held in the oak panelled Council Chamber room in the Guildhall (which dates back to around 1440) in the Centre of Abingdon. In 2015 the town council decided to close this facility, so as to renovate it and to improve its use. All the lodges and chapters, etc who met there came together to agree a move to The Coseners House hotel. This is just 100 yds away and stands in the grounds of the Medieval Abbey, where we have been meeting since. The hotel takes its name from the “Cuisinier” or “Kitchener” (the person responsible for providing food for the Abbey). The older part of the present building is the central portion which dates from the mid-eighteenth century. Its Thameside location, excellent gardens and the range of facilities the hotel has to offer including over-night accommodation, make it an ideal location for our meetings, Festive Boards, Ladies’ Nights and LOIs.